1) You’ve characterized today’s business environment as the ‘Creative Economy’; what is the Creative Economy and how does it provide opportunities for today’s entrepreneurs? The Creative Economy is the term I use to describe the dynamic, rapidly evolving, technology-driven environment in which only the creatively adept will survive. It requires progressive thinking, enlightened approaches and creative solutions, and we’re witnessing a sea-change in business values and practices, in response to this need. Creativity holds the key to sustainable growth and success, and companies that don’t actively cultivate a creative culture will no longer thrive. The Creative Economy is being driven by a whole new generation of young, hyper-connected entrepreneurs who are more concerned about added value, sustainability, ethics, collaboration and social investment than they are about the bottom line. Many of them are grasping the lucrative opportunities that a creative culture offers, and multi-million-dollar companies are developing at lightning speed, casting aside the cumbersome business models of the past. The old business models don’t work in today’s socially-connected society and the traditional thinking that generated boom-and-bust cycles, conflict and dysfunctional practices has brought us to the ‘tipping point’—the limits of our own sustainability. 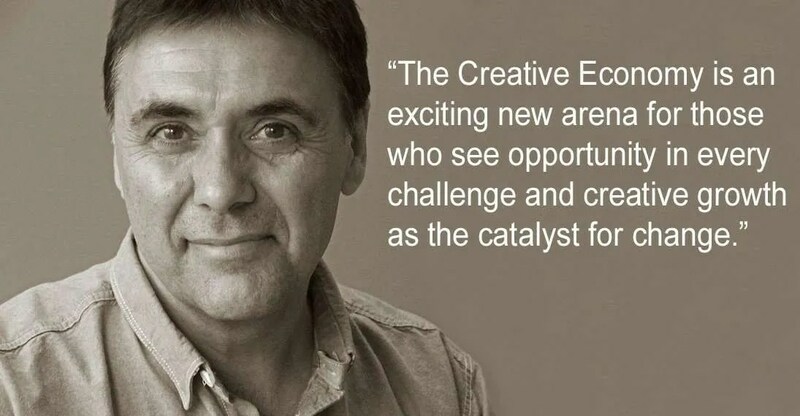 The Creative Economy is therefore an exciting new arena for those who see opportunity in every challenge and see creative growth as the catalyst for change. 2) What was your vision for Creative COGS, and how can it be used to deliver sustainable business results? The ‘COGS’ in ‘Creative COGS’ is an acronym for Conscious Organic Growth System. My vision is to facilitate this type of dynamic growth in companies that I work with. In the Creative Economy, long-term planning is difficult and often irrelevant. There are too many new technologies emerging and things are moving too fast for us to be able to set the controls of our business and relax. We have moved from an era of ‘predict and control’ to one of ‘sense and respond’. Thriving in the Creative Economy means being able to process things in the moment and respond to a dynamic environment in profitable ways. To do this, we need to hone our intuition and creative abilities―things that are all too often sidelined, to our detriment, in our logical, linear, analytical world. The logical brain is limited to what it has learned, whereas our creative faculties lead us to the future―to what we don’t yet know. Therefore, it is only when a business adopts a creative culture that it can be sustainable. 3) In addition to your business interests, you’re a prolific author and artist; what lessons have you borrowed from the arts that can be applied to doing business? Everything. If I have learned anything from my diverse experiences in life, it is that everything is connected―as it should be. I am energized by diversity and I feel it has created a balance in my life that I would not otherwise have achieved. And it is all relevant to my business. As an author, for instance, I am a project manager, engineer, innovator and marketer, as well as a storyteller. They say that artists are some of the biggest decision-makers in the world, since every mark on the canvas is a decision that builds towards a complex picture. I also find art to be the most challenging (and enjoyable) of my activities as I always strive to start with a beginner’s mind. There are no rules, no standard steps to follow, nothing to lean on―just a blank canvas, an open mind and my imagination. That’s where true creativity starts―and that’s where great breakthroughs are achieved in business. 4) How important has mentorship been in your personal development – both as a mentee and as a mentor? 5) Your approach to developing a business strategy includes a holistic view of the organization. How does the end product compare to a perhaps more traditional business plan? Every company is different, but the best ones are those that fully embrace the COGS process and are committed to delving deeply into their purpose, mission, vision and values in order to emerge with the best possible solution for all concerned. It’s not a linear process and it can sometimes be uncomfortable, but it always yields a much more successful outcome. Many companies make the mistake of trying to ‘bolt on’ partial solutions, but that never works, long term. It is only by taking a holistic approach that sustainable solutions can be found. If those solutions end up looking something like a traditional business model, then that’s fine, but it cannot be the goal at the outset. 6) How can social networks, such as EFactor, play a part in the Creative Economy? Social networks such as EFactor are an intrinsic part of the Creative Economy. The two cannot be separated. They are the lifeblood of modern communications, enabling the Creative Economy to function and stimulating creative activity and interactivity across the globe. I am continually impressed by the quality and diversity of people I meet through such channels and have built up a huge and valuable bank of expertise, potential clients, suppliers and friends. This strengthens my business and enriches my life, while stimulating me to reciprocate with my whole palette of skills. It feels like a very healthy way to co-create a better future―a way of supplanting political agendas, cultural differences and misguided concepts with straightforward human interaction that is so much more valuable. 7) Based on your personal experiences, what tips would you give to entrepreneurs, and those starting their own business? 1. Be very clear about what you want to achieve in your life and your business, without separating the two. 2. Choose to enjoy your work—or choose work that you enjoy. You will spend most of your waking hours working in your business, so be sure that it is enjoyable, otherwise you will ultimately make yourself ill.
3. Follow your passion with purpose and your purpose with passion. Everything else will cause you pain. 4. Be outcome-driven, not process-driven. This will keep you creative and alive to opportunity. 5. Always listen and learn, and be aware of what is happening in your environment. 6. I have a maxim that helps me stay on track: If it’s not simple, there must be something wrong with it. Avoid unnecessary complexity, and find the beauty in simplicity. 7. Focus on creating something new rather than competing for what has already been created. 8. Question everything. New answers are the prize for making the effort. 9. Be concerned only with what you can contribute to your customers to make their lives better. Win-win results are the true measure of success. 10. Be sure to maintain your creative core and exercise it at all times. This is your route to sustainability, fulfillment and a happy life. A winner for charities, artists and business. Can you make art work for you?